Adventures in Yiddishland examines the transformation of Yiddish in the six decades since the Holocaust, tracing its shift from the language of daily life for millions of Jews to what the author terms a postvernacular language of diverse and expanding symbolic value. 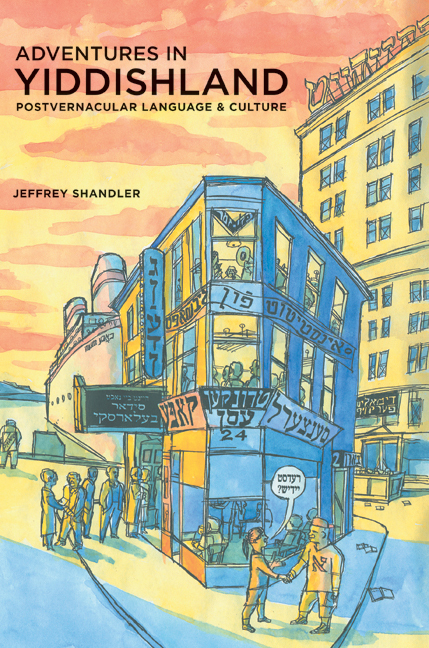 With a thorough command of modern Yiddish culture as well as its centuries-old history, Jeffrey Shandler investigates the remarkable diversity of contemporary encounters with the language. His study traverses the broad spectrum of people who engage with Yiddish—from Hasidim to avant-garde performers, Jews as well as non-Jews, fluent speakers as well as those who know little or no Yiddish—in communities across the Americas, in Europe, Israel, and other outposts of "Yiddishland." Jeffrey Shandler is Assistant Professor of Jewish Studies at Rutgers University. He is author of While America Watches: Televising the Holocaust (1999), editor of Awakening Lives: Autobiographies of Jewish Youth in Poland before the Holocaust (2002), and coauthor of Entertaining America: Jews, Movies, and Broadcasting (2003), among other books. He lives in New York. 6. Wanted Dead or Alive?